The Ware for December 2013 is shown below. 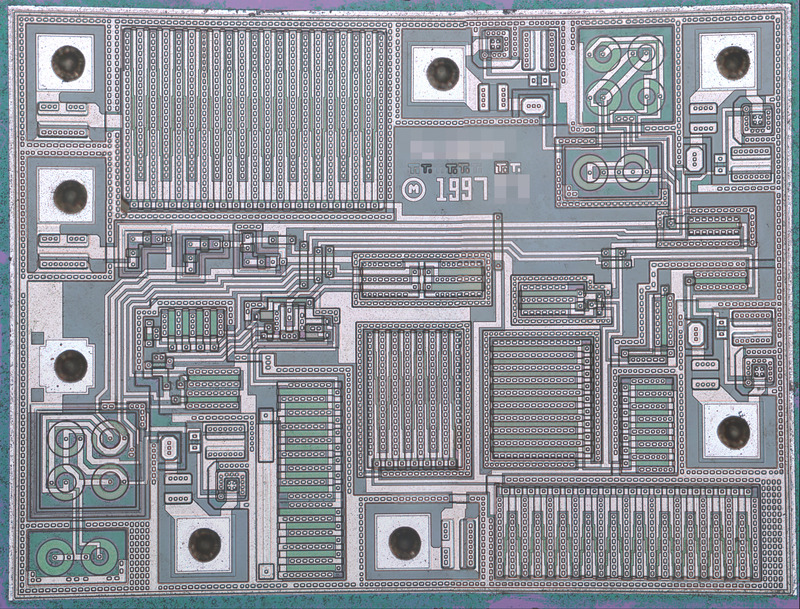 It’s been a while since I’ve had a proper die shot for a name that ware. Thanks to T. Holman for sharing this ware with us! This entry was posted on Monday, December 9th, 2013 at 8:49 pm and is filed under Hacking. You can follow any responses to this entry through the RSS 2.0 feed. Both comments and pings are currently closed. Is this some form of timer such as a 555? Looks like some kind of microwave circuit. Most of the large structures look suspiciously like waveguide filters, but I’m not enough of a wizard to definitively identify any of them. No, waveguides would be too big, millimeter sized structures are suited for the terahertz range. micrometric hollow waveguides on silicium would be suited for micrometric waves, e.g. light, and that would be photonic circuits. 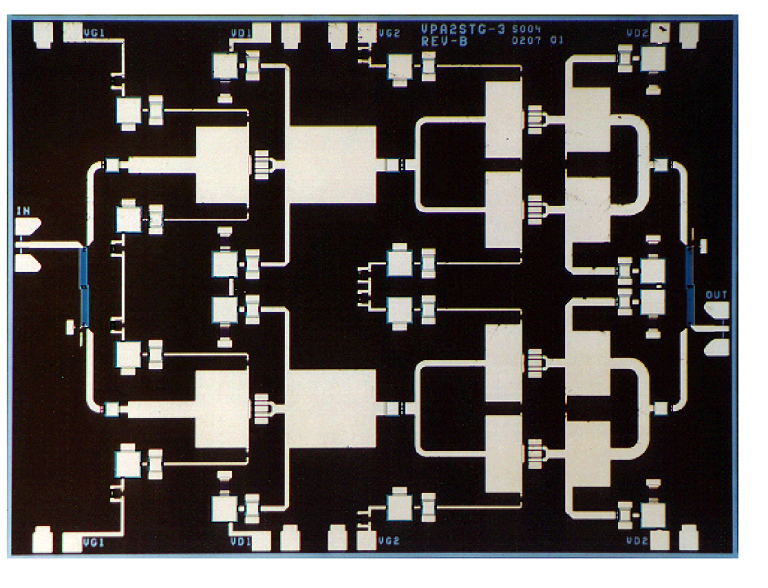 MMICs have long folded strip lines structures, these components are often amplifiers and have parallel wired RF transistors that requires wilkinson dividers, whose lengths must be matched to quarter waves. rf/if saw filter from a motorola pager – maybe something fancy like a pagewriter? Re: the “SAW” look: If you look at the comb-like structures with the small dots on the fingers, you’ll realize that there’s always a finger connected to one side of the areay, the next finger will be donnected to the other side. And there is a small thin metal in between. These structures that some commenter classified as a “SAW” is actually a transistor, with the “big dotted fingers” being metal-layers with a lot of vias. Those devices are supposed to carry a lot of current. I’m counting 6 of the very large transistors, the very large one at 11o’clock and at least the pretty central one (at 6 o’clock, just above the pin connect), but also the 2 other larger ones at 5 o’clock seem to share the gate (the bigger metal just below 1997). Strangely enough, they all seem to have different size, which equals different current rating. If you look at the pin-pads, there are three distinct types. The lone one at 9 o’clock without additional circuitry (possibly GND/package/substrate), the type at 10, 11 and 6 o’clock (as far as my guesses go, it’s a single protectino diode) and a identical cell for the pins at 7:30, 12:00, 2 o’clock and 4 o’clock which seems to be more elaborate. I see only very little “small signal” transistors (at 9 o’clock) and the pretty obscure structures with the circles in them. So, a guess, and I’m really feeling not good at this, because of the few low-power components) would be (parts of a) 2 channel switch-mode voltage regulator, maybe a buck/boost (which has the equivalent of a H-bridge between the switcher’s coil’s pins, have a look at the http://www.linear.com/product/LTC3531 datasheet, for a low-current version). Buth with a much higher power rating. Definitively a Texas Instruments chip. Power seems crucial, maybe a MOS driver, or a level converter. how do you know it’s definitely a TI chip? It’s probably the 8 visible Ti marks in a row. I’m not as convinced of it’s provenance. Huh. The Ti marks, I see those as mask alignment/etch quality metrics. They do kind of have the shape of Ti, but each one is printed on a different layer and the shape of the feature is typical of what you’d use to make sure you don’t have a problem on a particular film layer. There’s some other features that I think could be very distinctive in terms of identifying the process and fab used, but I haven’t seen anyone comment on those yet. A TI MAX232A from 1990 with the little M logo. Isn’t that a Motorola logo to the left of the date? It’s the symbol for mask copyrights, e.g. the patterns used to define the layers on a chip. A tiny edifice of copyright law that still retains a semblance of sanity; perhaps because it’s a better use of funds to develop newer, faster chips rather than pay lobbyists to protect existing designs for over a hundred years. Big transistor, three-part resistor ladder right under it, a middle rung of the ladder tied to a pin that runs to two comparators, a logic output… it’s a 555 clone, isn’t it? Definitely a TLC551Y from Texas. It’s definitely a 555 timer, but it’s CMOS (or possibly BiCMOS, but looking again I think that’s unlikely). The three part resistor ladder from the 555 is implemented as 6 FETs in 3 epi pockets (two per pocket). The bond pads are (clockwise from the top left) DIS, THRESH, CV, RESET, OUT, TRIG, GND, VCC. Notice the protection circuits on the input pins and the large FET output stages for OUT and DIS (push pull and open drain, respectively). So I will guess it is a TI TLC555. 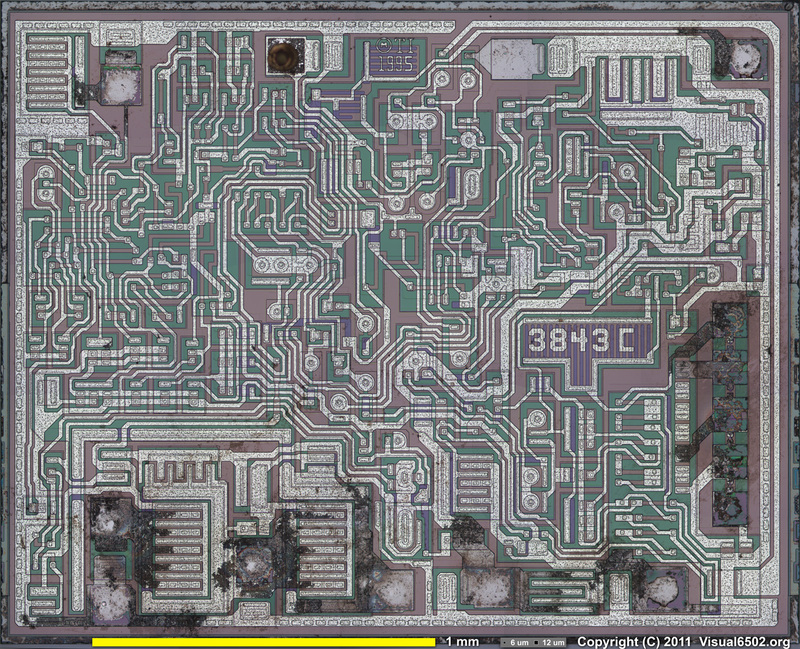 – I can identify 4 pads (upper center, upper right, right center, lower left) with similar circuitry, maybe inputs? – Then there are two outputs (upper left and lower center) with a larger grid structure, maybe those are driver circuits? many transistors in parallel? 1997 is way too late for a 555 clone and I agree it looks like it’s meant to handle some power. There isn’t enough symmetry for a dual opamp. I’m going to take a wild guess and say a small switcher like the MC3063 type. Given all eight pins and the date, maybe the NCP3064? Agree. It has to be a digital part that drives some power. There are not enough transistors to make that a linear regulator or an op amp. The 1997 font and (M) give it away. 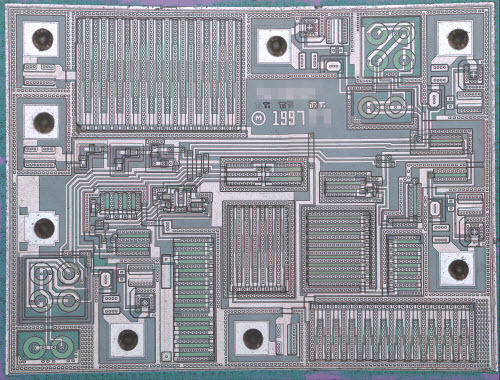 At first looks, it looks to be a dual something, but the logic in it seems to converge towards the left of the chip, indicating that it does one combined function. I’ve looked through the analog chips produced by TI in 1997, and found the UC3708 dual non-inverting power driver. It has dual outputs, and has some input logic that controls them both together. This is a NE555 compatible part, revised on 1997 (as the date on the mask). Datasheet also revised in 1997. TI layout style very distinctive, many diagonal and round shapes. – while all the structures in the bottom right quadrant are 3 chained cmos inverters (N/P-FET pairs), each bigger than the other driving the TTL/CMOS output. I also thought initially those were bipolars but then realized later they were FETs. Any ideas as to why circular, vs. doing say, a square or octagonal annulus, or even just two parallel banks of conventional horizontal and vertical finger transistors? -Smooth contours (no sharp corners) yields higher breakdown voltage. I’m guessing a power amplifier for a mobile phone. The layout doesn’t make too much sense, but it could be a dual band or so. Hello, i’m pretty interested in supporting this laptop for GNU. Also, who’s holding the laptop in the picture, i’m interested in knowing, she has quite an exquisite rack. Skype: No way! That’s nonfree (freedom-denying) software. Having read this I believed it was very enlightening. I appreciate you taking the time and energy to put this content together. I once again find myself personally spending a lot of time both reading and leaving comments. But so what, it was still worthwhile! I think it’s the truth.